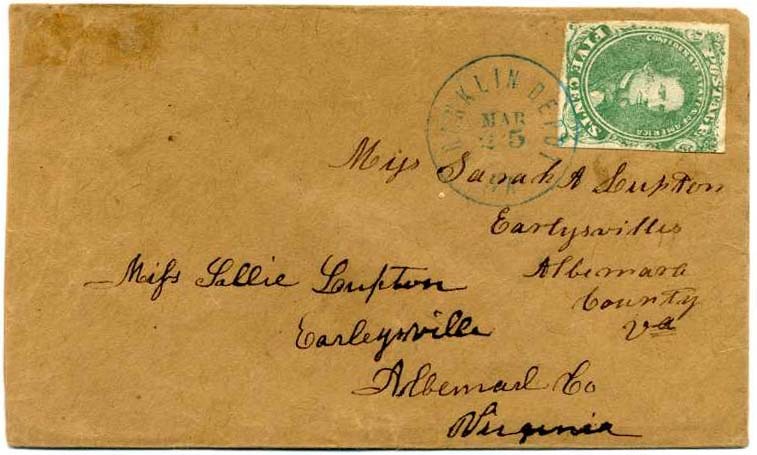 CSA 1, 5¢ green tied neat FRANKLIN DEPOT / Va. // MAR / 25  blue cds on fresh cover to Miss Sallie Lupton, Earleysvlle, Albemarle Co Virginia, Very Fine. $200. 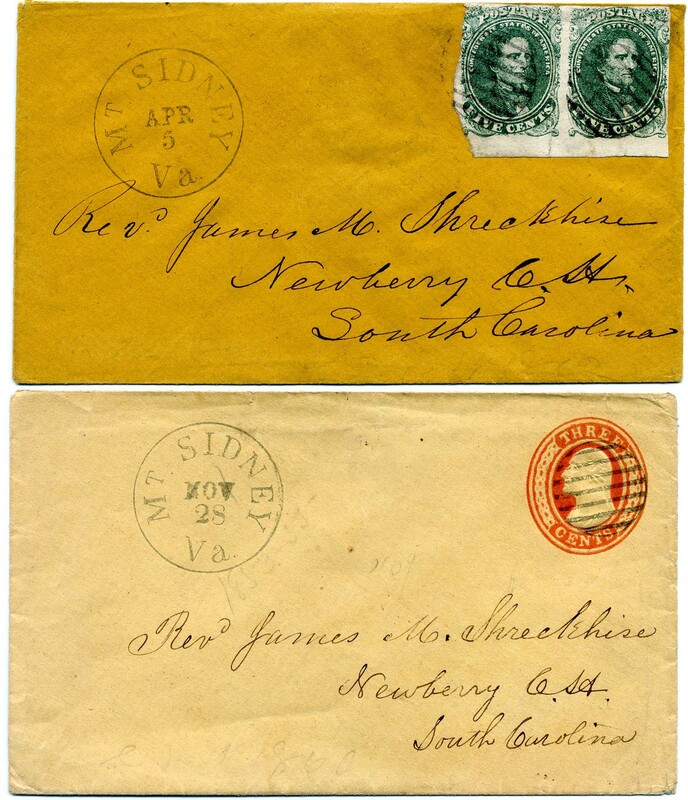 CSA 1, 5¢ green pair tied LAFAYETTE / Ga. // JUL cds on homemade cover to Miss H. J. Harris, Suwannee, Gwinnett Co, Geo, Very Fin.e $400. Thomas Butler KING (1800-1864) was a commissioner of the Confederacy in Europe 1861-1863. Much more information on linked page. CSA 1, 5¢ green tied blue COLUMBIA / S.C. // 14 / FEB  Valentine’s Day cds on cover to “Mr. 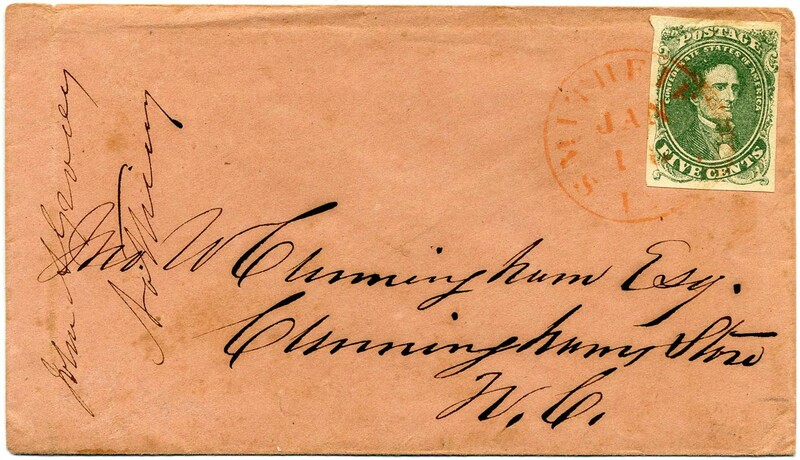 John D. Leitner, Fernandina, Fla, Care of Capt Martin, Flying Artillery Comp[any]” $300. J. D. Leitner is shown in military records as a sergeant in Florida Marion Light Artillery. More information on linked page. 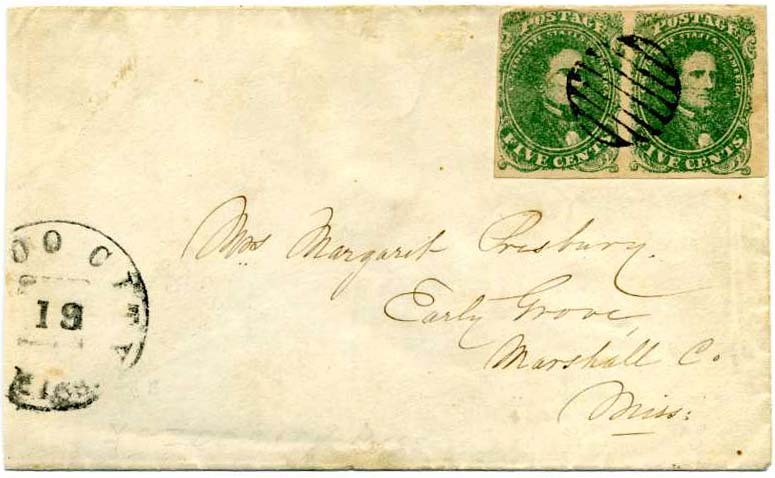 CSA 1, 5¢ green pair, Stone 2, Positions 29-30 as plated by Knapp, grid canceled with matching YAZOO CITY / Miss // SEP / 19 on cover to Mrs. Margaret Presburg, Early Grove, Marshall Co., Miss; slightly reduced at left, Ex Knapp and Hart. $250. 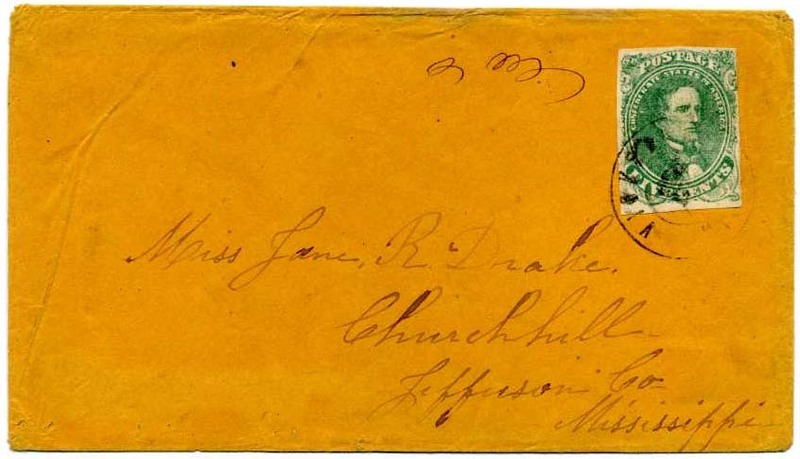 CSA 1, 5¢ green tied VICKSBURG / Miss // DEC / 10  on cover to Miss Jane R. Drake, Churchhill, Jefferson Co, Mississippi; Stamp with several small varieties (colorless line from upper left “V” to circle, colorless flaw to left of head, large colorless dot to right of “T” in postage, etc.) $180. CSA 1, 5¢ green tied NATCHEZ / Miss // SEP / 2? 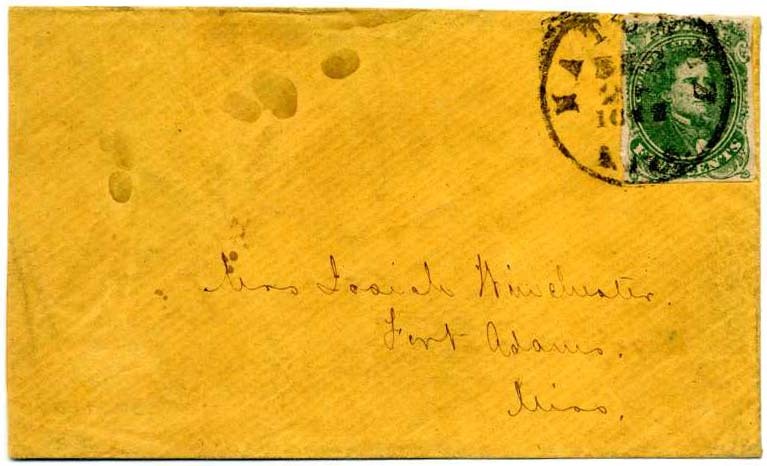 / 1862 cds on cover to Mrs. Josiah Winchester, Fort Adams, Miss; slightly reduced at left and bit of staining. $150. CSA 1, 5¢ green right sheet margin copy tied TUDOR HALL / Va. cds on cover to Glade Springs, slightly reduced at each end. $180. 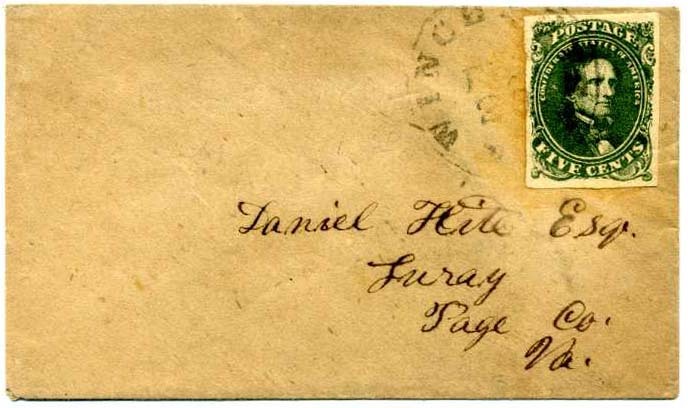 CSA 1c, 5¢ deep olive green (4 large even margins, superb, fabulous color) tied WINCHESTER / VA // FEB / 20  cds on small homemade cover to Daniel Hite Esq, Luray, Page Co., Va. Looks like the stamp has been removed at some time and re-positioned. Winchester changed hands over 80 times during the war. According to local lore, the postmaster would look out his window to determine whether to put Confederate or Union stamps on the envelopes. Ex Hambrecht $600. 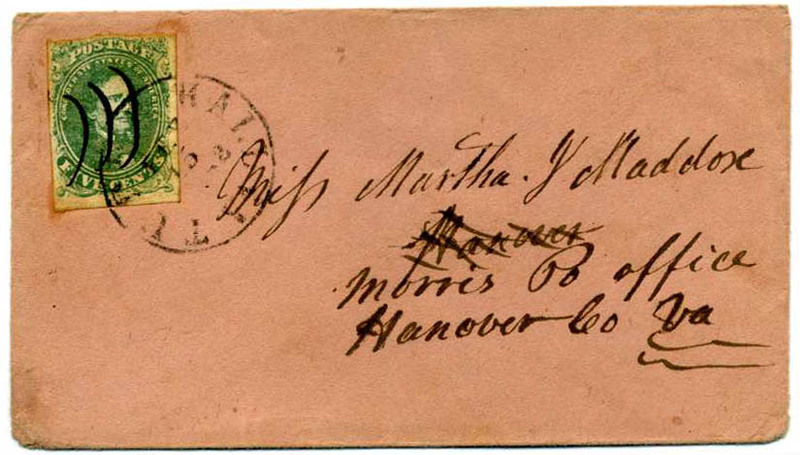 CSA 1, 5¢ green tied on cover by neat TUDOR HALL / VA // FEB / 15 / 1862 cds as well as pen strokes on light pink cover to Miss Martha J. Maddox, Hanover (crossed out) Morris P. Office, Hanover Co., Va. Tudor Hall was the post office for Manassas. $190. CSA 1c, 5¢ olive green (pre-use lower right corner fault) tied CULPEPER C.H. 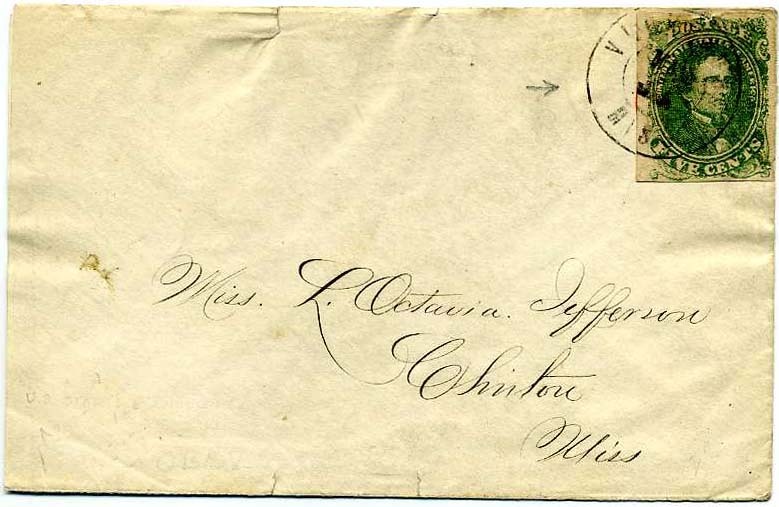 / Va. // DEC / 1861 cds on cover to Miss Jennie Latham, Care John F. Latham, Esq., Lynchburg, Va. $135. 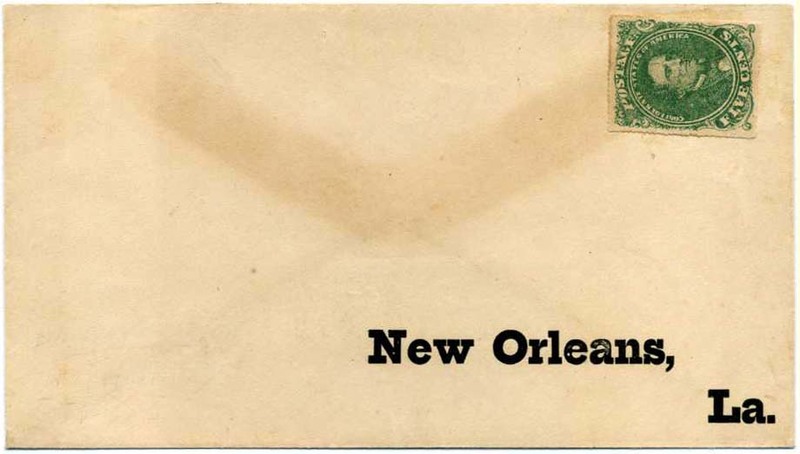 CSA 1 variety, 5¢ green, Baton Rouge Roulette, unused on original envelope with "New Orleans, La." printed address, toned from back flap as usual; from the "desk find" acquired in 1938 by Raymond H. Weill. 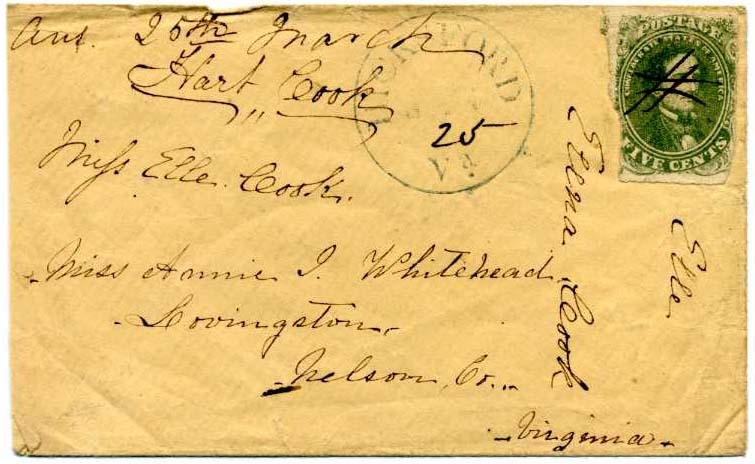 When Baton Rouge was occupied by Federal forces early in the war, a small quantity of envelopes were prepared in advance by a local merchant and left unused, 2012 SCV $500 as unused and $1,750 used on cover, Scarce and desirable. $600. 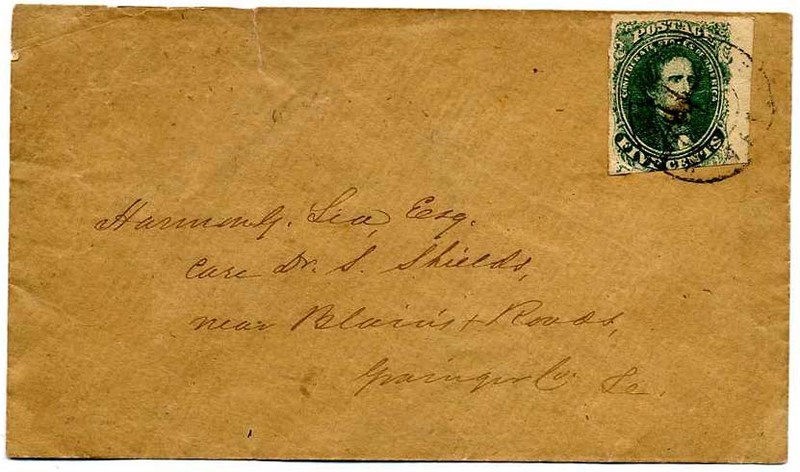 CSA 1, 5¢ green (ms canceled) used on folded letter with WINDSOR / N.C. // MAR / 26  cds, addressed to H. C. Hardison, Esq., Williamston, N.C. from the Bank of N.C. headed the same date saying “Your $200 has been due a long time…I enclose a note which please sign & send back…” Also enclosed in the printed note signed H. C. Hardison, principal, and A. C. Williams & Henry P. Gibson, securities. $200. 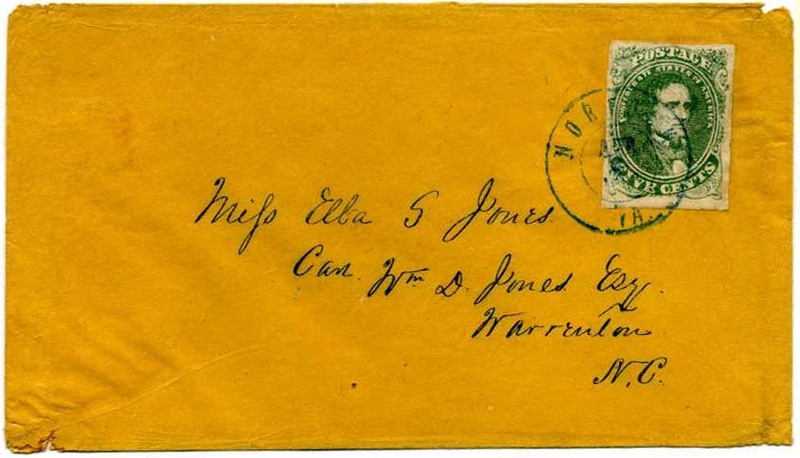 CSA 1 variety, 5¢ green with CEDILLA C on “Confederate”, a CSA Catalog variety, tied blue NORFOLK / VA double circle cancel on cover to Miss Ella S. Jones, Care Wm. 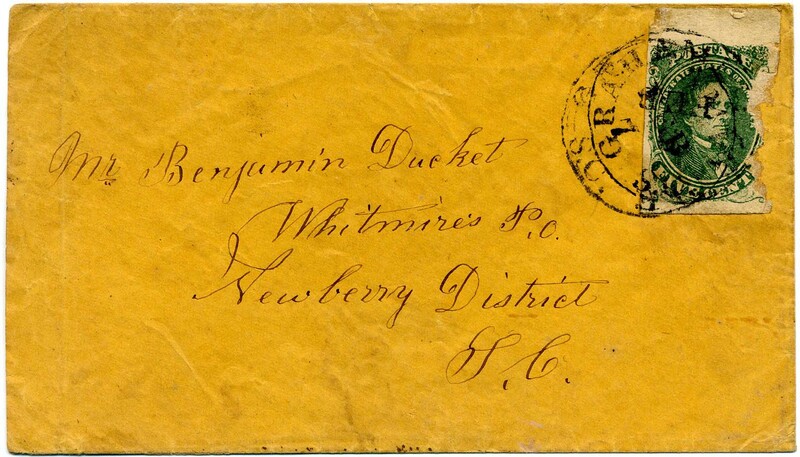 D. Jones Esq., Warrenton, N.C. $200. 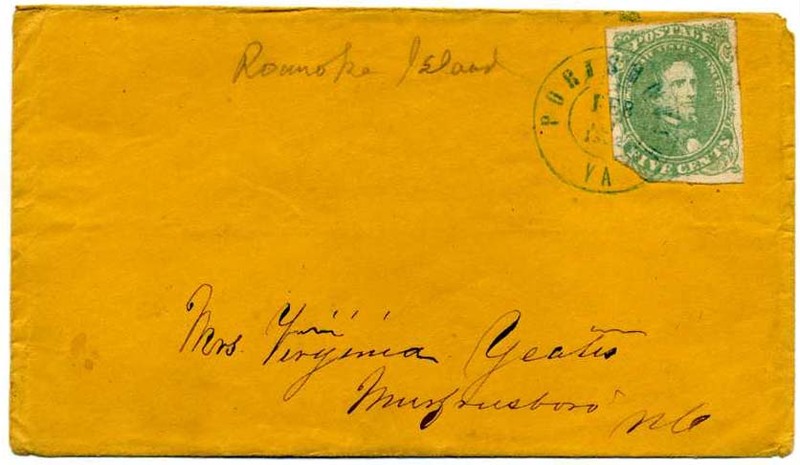 CSA 1, 5¢ green tied by neat blue PORTSMOUTH / VA // FEB / 13 / 1862 double circle on clean cover to Mrs. Virginia Yeates, Murfreesboro, NC with contemporary pencil notation at top “Roanoke Island”. $200. 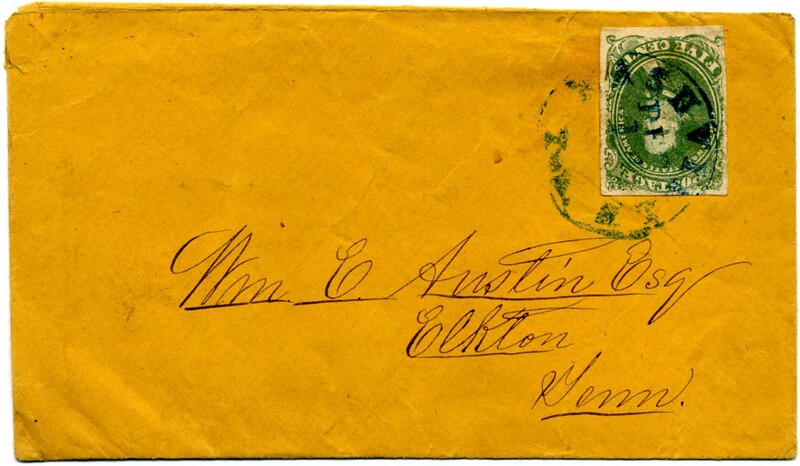 CSA 1c, 5¢ olive green (small faults) used with pen cancel on cover with blue HICKSFORD / Va.cds to Miss Annie I. Whitehead, Lovinston, Nelson Co., Virginia with Miss Elle Cook also noted and with contemporary “Ans 25th March / Hart Cook”. $150. 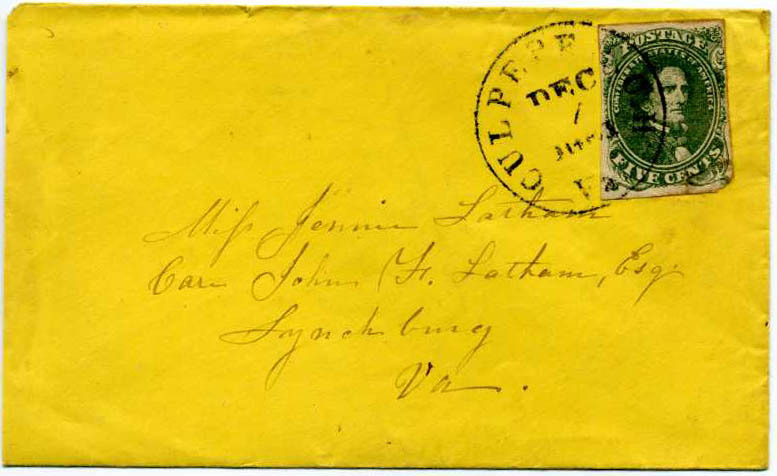 CSA 1, 5¢ bright green (4 large margins) pen canceled with neat clear COBHAM / Va. neat cds (ms Mch 19 date) on lemon cover to Capt. Peyton S[kipwith]. Coles, Estouteville, Charlottesville P.O., Va with W.C.R. at lower left; Ex Thacker. $300. Capt. Peyton Skipwith Coles enlisted as a Surgeon 8-9-61 in Field & Staff of 59th Virginia Infantry according to certain military records which likely had him mixed up with Surgeon Walter Coles. He was educated at UVA. 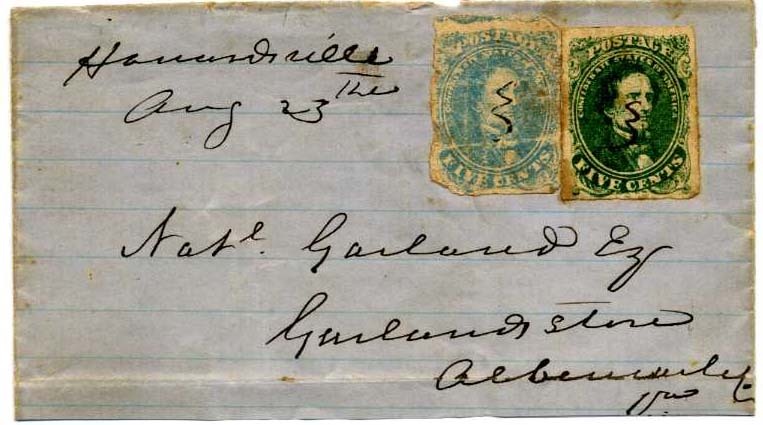 CSA 1, 5¢ green and CSA 4, 5¢ blue (small faults) used in combination with manuscript Howardsville [Va] Aug 23 cds on partial folded letter blue on lined paper dated August 21st 1862 to Bank of Howardsville; addressed to Natl Garland Esq., Garlands Store, Albemarle Co., Va.; letter concerning a check he has in hand and funds of John E. O. Wingfield in their bank; top and bottom “flaps” missing but substantial part of letter there; Ex Thayer and Thacker. $500. 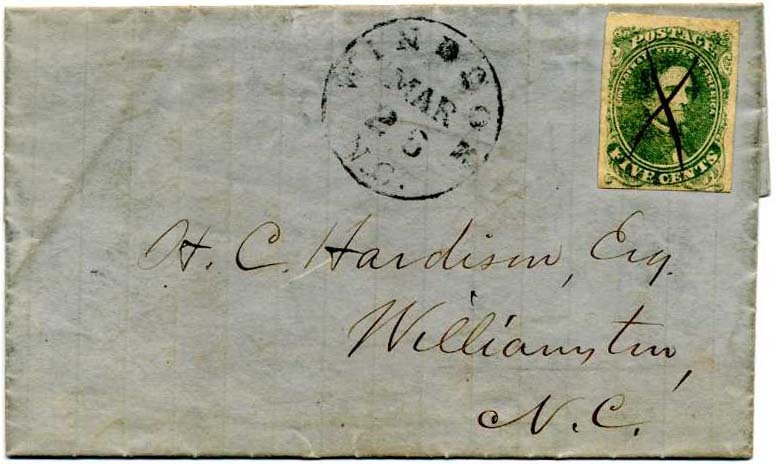 CSA 1, 5¢ green (4 margins) tied with RICHMOND / Va. cds on cover to Matthew H. Harris Esq., Roberts Mill, Nelson Cty [Va] with manuscript “Missent to North Garden [Va]” across the top, also tying stamp; flap faults and light stain at left, Scarce, Ex Thacker. $200. 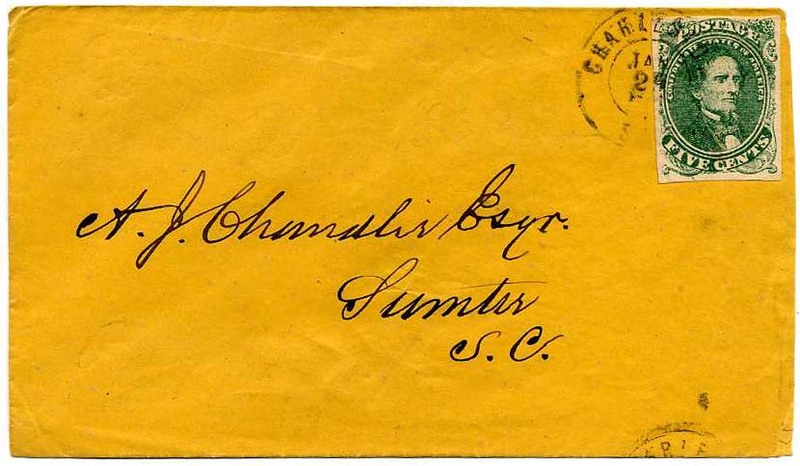 CSA 1, 5¢ green (4 margins) with transient printing flaw at the bottom of CE in CENTS; tied CHARLESTON / S.C. // JAN / 25  cds on cover to A. J. Chandlir (sic) Esq. Sumter S.C. $250. 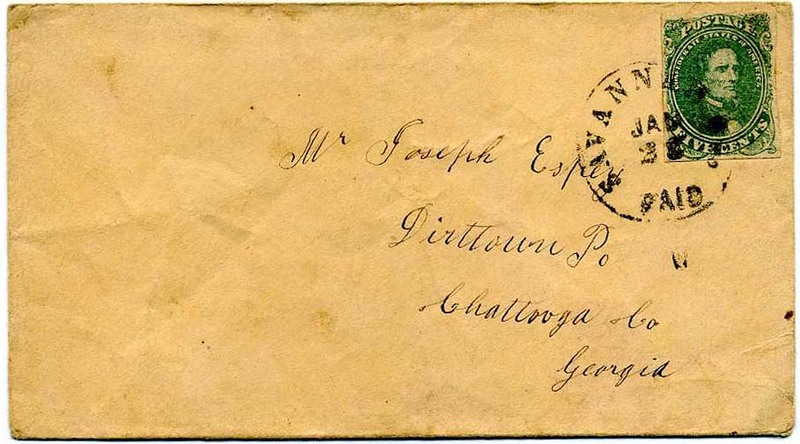 CSA 1, 5¢ green (4 margins) tied SAVANNAH Ga / Paid // JAN / 22  cancel on cover to Joseph Espey, Dirttown PO, Chattooga Co, Georgia; small flap tear. $250. 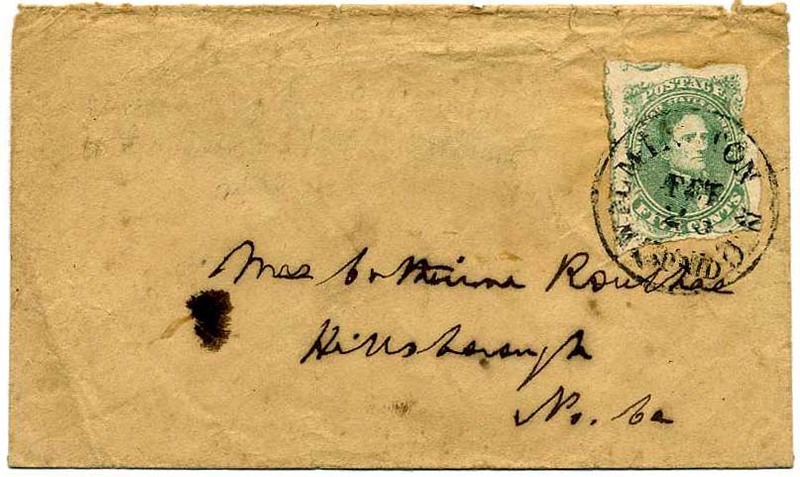 CSA 1, 5¢ green (4 large uneven margins showing portions two other stamps) tied neat WILMINGTON N.C. / PAID // FEB / 25  cds on cover to Mrs Catherine Routhee, Hillsborough, No Ca; a bit rumpled. $150. 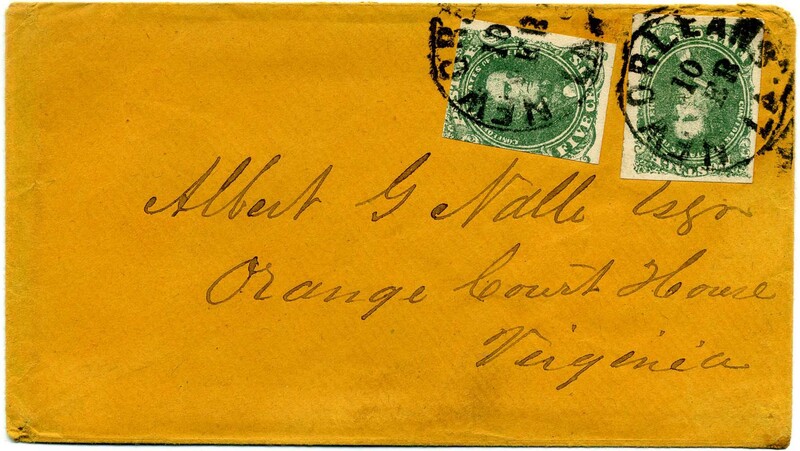 CSA 1c, 5¢ deep olive green Stone AB with ragged margins tied ORANGE SMITHFIELD / VA // DEC / 14  cds on cover to Miss Lou V. Myrick, Macon Depot, NC; incredibly deep olive color and early date, Van Dyk MacBride pencil notes on verso, slightly reduced at left with tiny sealed tear at left edge. $500. 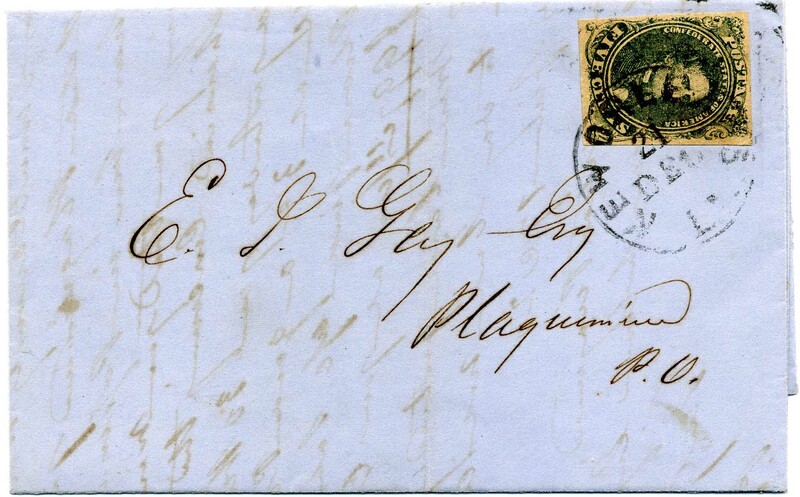 CSA 1c + 1, 5¢ green, two copies tied together by bold GORDONSVILLE / VA. // AUG / 2 /1862 cds on small cover to Mr. A. M. Pilcher, Box 899, Richmond, Va.; two very different stamp impressions, the left being a deep olive green and the right a very rough dull green impression. $325. 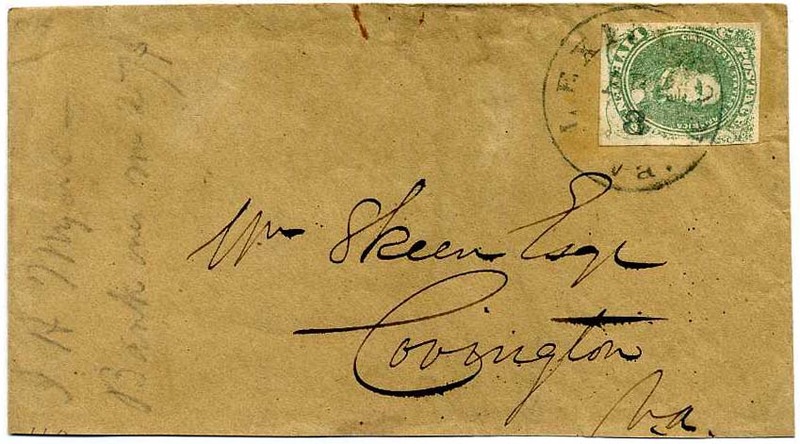 CSA 1, 5¢ green (4 margins) tied neat LEXINGTON / Va. // APR / 8  cds on cover to Mr. Skeen, Esq, Covington, Va. with pencil contents docketing along left side that contents were from J H Myers, slightly reduced and bottom back flap missing. $160. 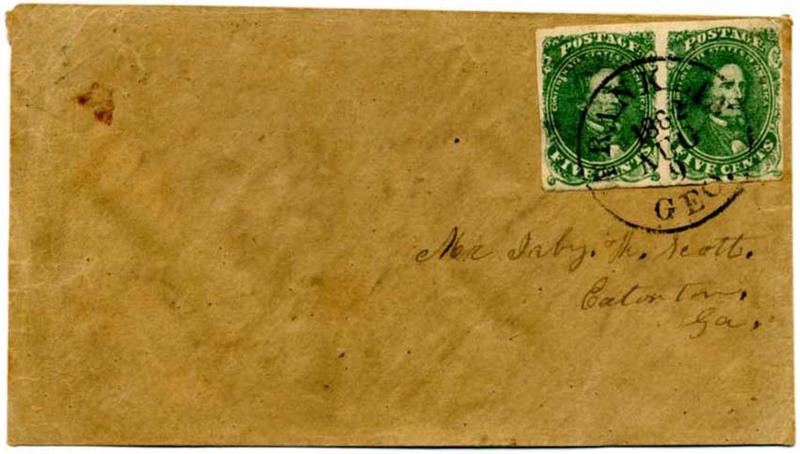 CSA 1, 5¢ green (small faults) used over U26 3¢ star-die entire envelope tied by VICKSBURG / MISS // double circle postmark, addressed to Miss L. Octavia Jefferson, Clinton, Miss. Small cover edge tears and bit reduced at left. Interesting adversity use requiring the sender to forfeit the original cost of US postage. Plating on back in pencil noted as Stone 1, position 1 (not verified). $225. 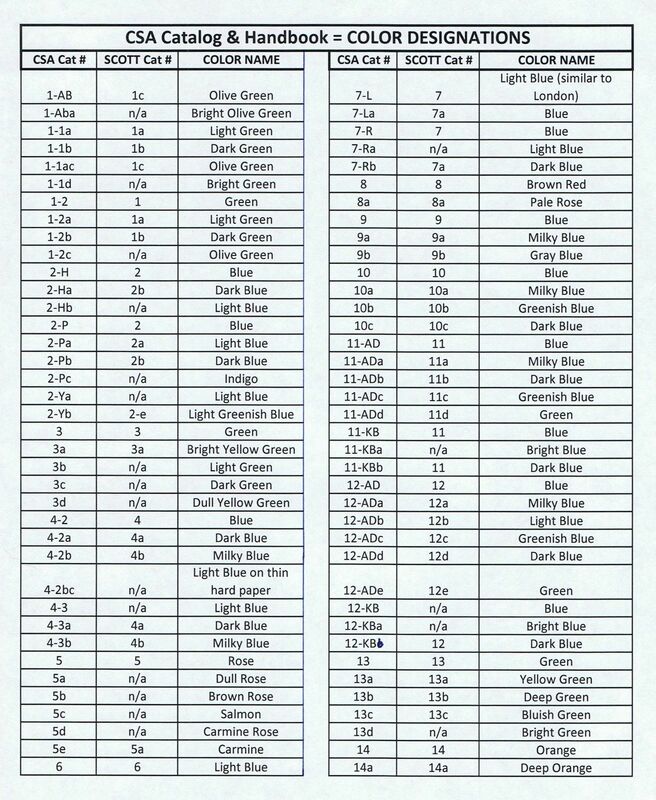 CSA 1b, 5¢ dark green right sheet margin single (couple small faults) tied KNOXVILLE / TEN double circle and pen cancel on homemade cover to “Harmon G. Lea, Esq., Care Dr. S. Shields, near Blains X Roads, Grainger Co, Te” (today the Knoxville suburb of Blaine) Ex Scott Gallagher. Interesting docketing on top back flap “Mr. Story may oblige Maj. Lea by sending this by private hand if any offer before the mail. 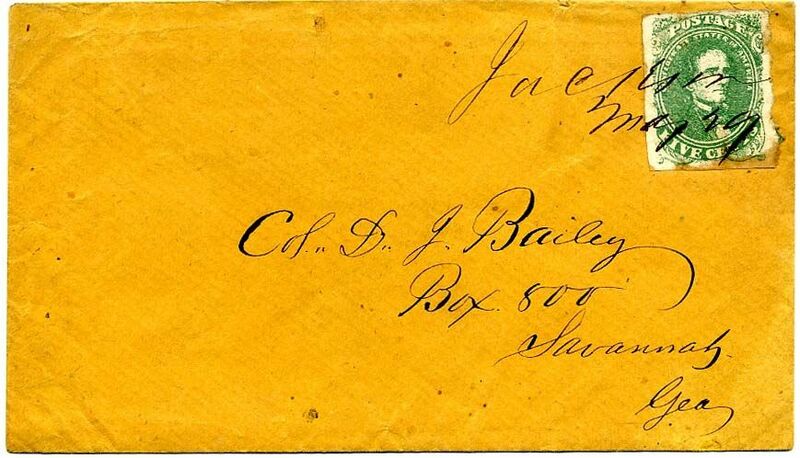 If not, he will please to mail this at Bean’s Station to go by Rutledge.” The Battle of Bean’s Station was December 14, 1863. Harmon G. Lea was a delegate to the convention in East Tennessee. 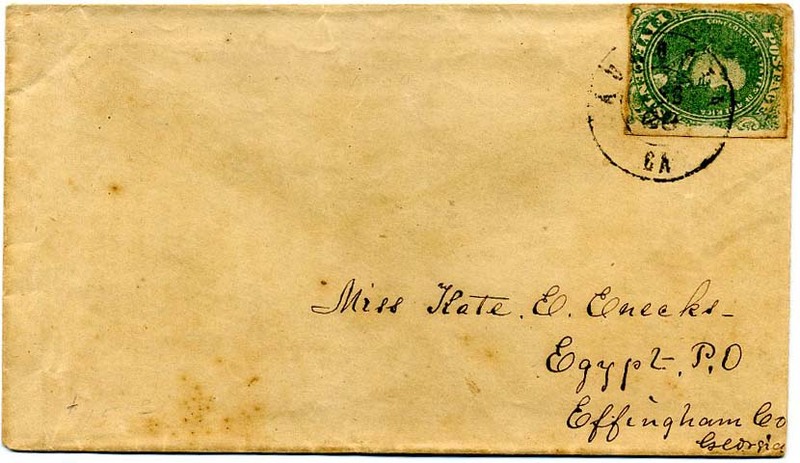 Major (not a rank, rather a given name) Lea apparently wrote the letter enclosed in the cover. $250. CSA 1, 5¢ green pair lightly tied WARRENTON / Miss. cds on cover to Col. W. R. Gattin, Summitt, Miss routed at lower left N.O.J. & G.N.R.R. (New Orleans, Jackson and Great Northern Railroad), inside of cover silked and appears back reattached. $225. 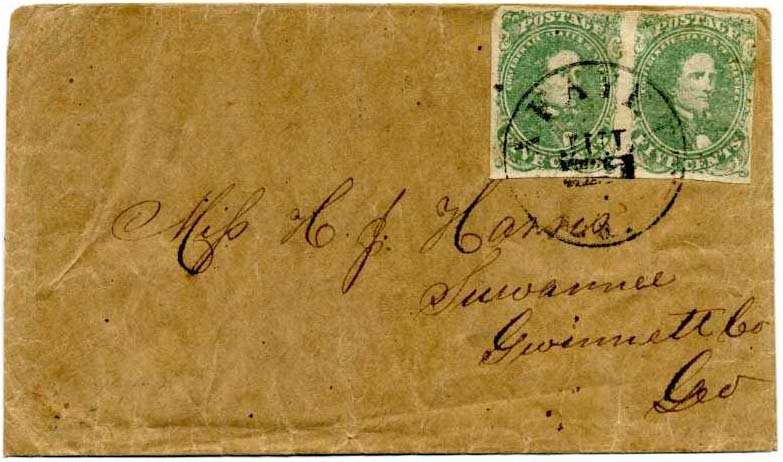 CSA 1, 5¢ green tied manuscript Jackson [Georgia] May 29  on cover to “Col. D. J. Bailey Box 500 Savannah Geo”. Georgia Congressman David J. Bailey established Camp Bailey with the permission of Governor Joseph E. Brown - Company K, "Chattahoochee Volunteers." $200. David J. Bailey served in Company K, the "Chattahoochee Volunteers". Much more information on linked page. 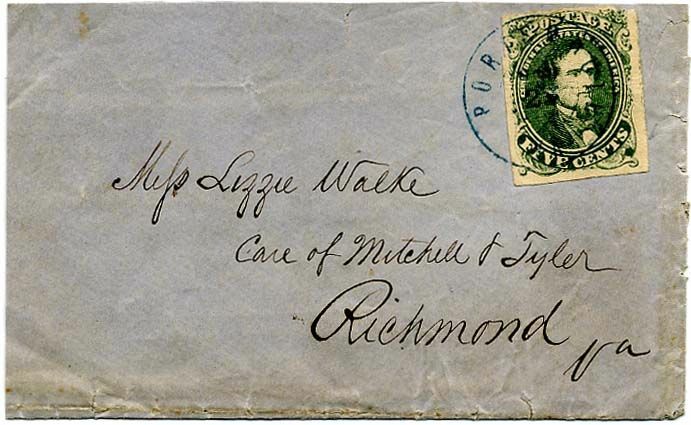 CSA 1-1, 5¢ green, Stone 1, position 29 with transient natural printing flaw at lower right corner, tied neat strike of blue PORTSMOUTH / VA. // NOV / 25 dc on cover to Miss Lizzie Walker, Care of Mitchell & Tyler, Richmond, Va.; reduced slightly at right and small part of flap missing, slight edge wear, Very Fine. Signed Peter Powell. $200. 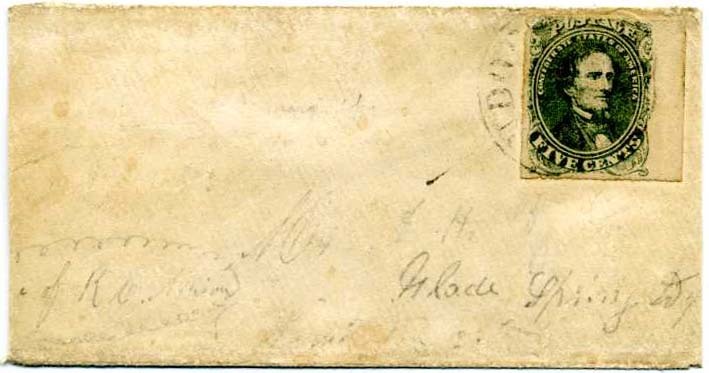 CSA 1, 5¢ green, Stone 2, position 17 (4 large even margins) tied blue grid with matching CHARLOTTESVILLE / VA // JAN / 30 / 1862 double circle postmark on cover to Jno. C. McClenaghan, Marion C.H., So.Ca. ; noted at upper left “less than 500 miles”, Ex Engstler and signed B. Green, plating done by a prior owner; tiny tear at upper right of cover otherwise Very Fine. Detailed military bio on linked page. $200. 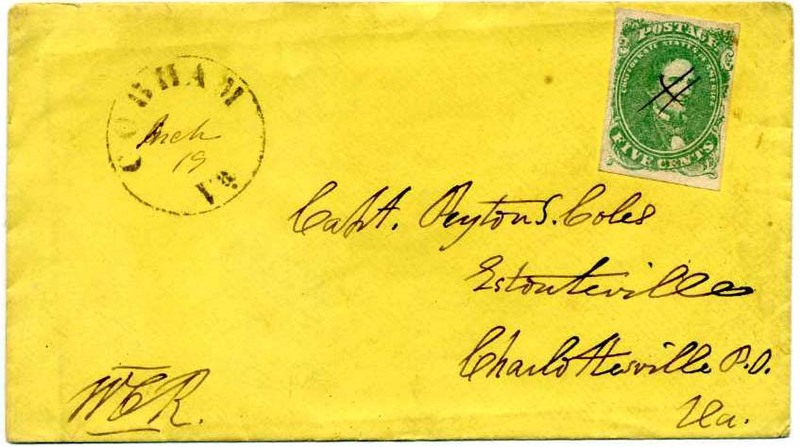 CSA 1, 5¢ green, 2 singles (slight scuff top of right stamp) used with pen cancels on opposite corners of small narrow envelope with matching “Ap 8” , most likely from Frederica, Ga. to “Hon. T. Butler King, Spotswood Hotel, Richmond, Virginia. Top back flap missing. 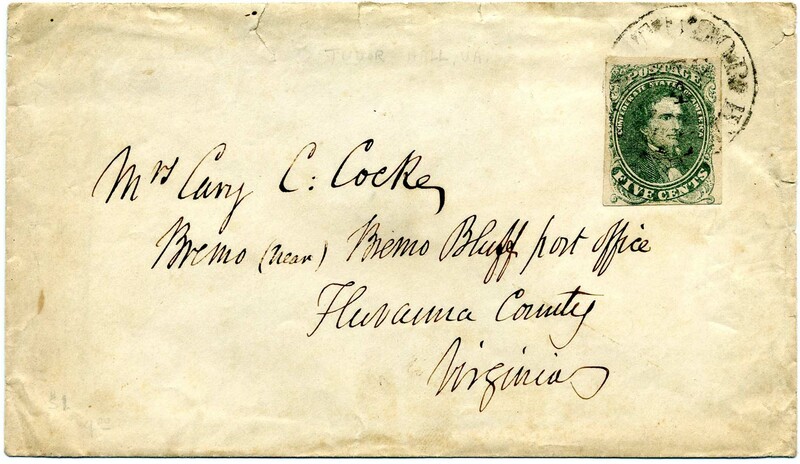 Handwriting matches other correspondence from his Frederica Ga. home during that time period. Thomas Butler King is remembered primarily as a planter and politician from coastal Georgia. The story of King’s son “Lordy” and his faithful servant “Neptune” are related in my column in the Sept 2009 American Stamp Dealer & Collector at ASDSEP09.pdf $300. 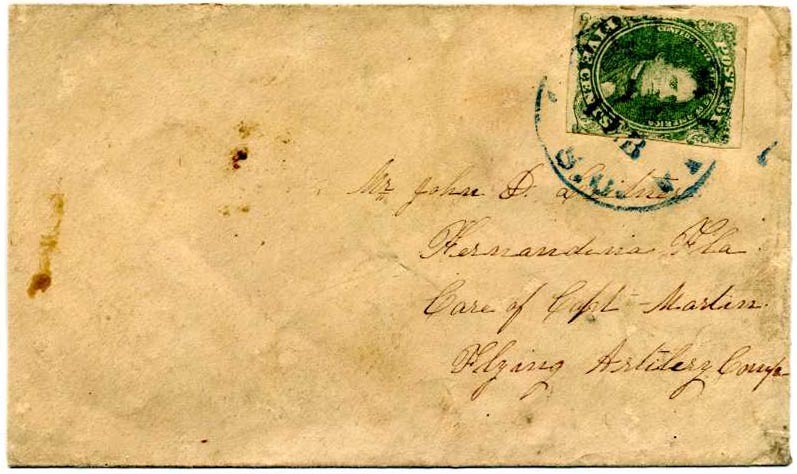 CSA 1 and CSA 6, 5¢ green lithograph and 5¢ blue London typograph tied together by RICHMOND / Va. // AUG / 14 / 1862 cds on clean homemade cover to Willie B. Cannada, Providence, Va. Wonderful MIXED FRANKING $450. CSA 1, 5¢ green tied MADISON / Ga. // MAR / 15  on cover to J. M. Allen, Care Capt Peacock, Savannah, Georgia; slightly reduced at left. Allen was undoubtedly a soldier but would take more research to determine which one of many by that name. $200. 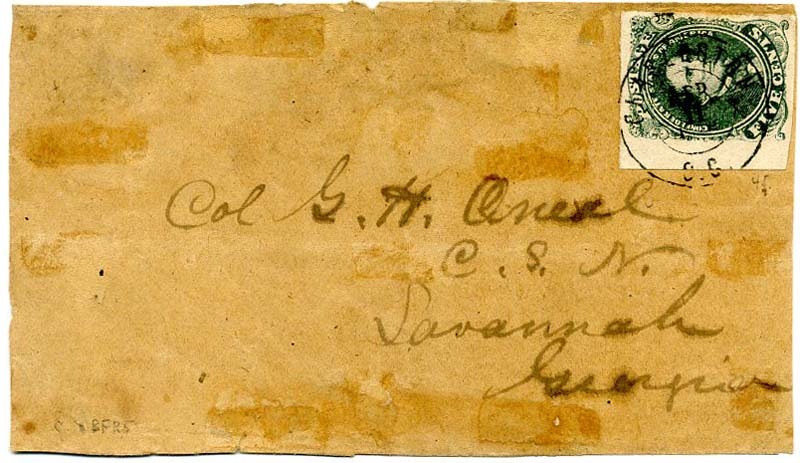 CSA 1c, 5¢ olive green left sheet margin – superb stamp used with beautifully struck CHARLESTON / S.C. // APR / 11  dcds on cover front (no back) addressed to Col. G. H. Oneal, C.S.N., Savannah, Georgia. $400. George H. O’Neal (1822-1887) was from Pensacola, Florida. He served in the Confederate Provisional Navy and regular Confederate Navy as assistant paymaster. He served on the CSS Georgia (Savannah Station 1861-62, scuttled 1864) and Mobile Station (1864-65). 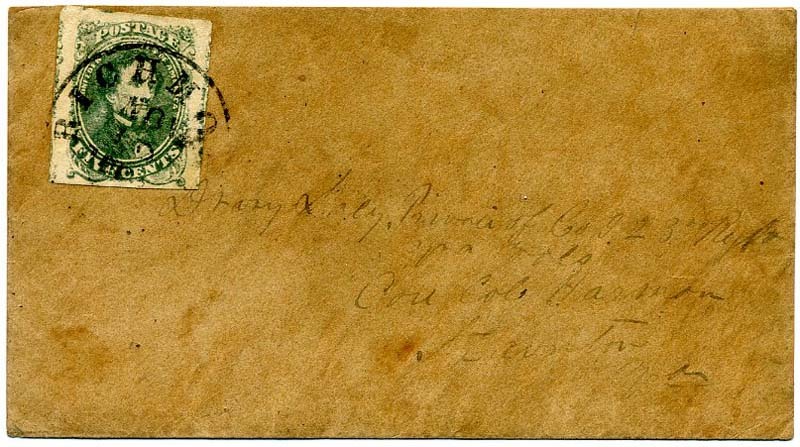 CSA 1, 5¢ olive green, 4 margins with 3 enormous picture frame margins plus ample at bottom (small corner crease at UR) on cover to Drury Lacy, Private of Co G, 23rd Regt. Va, Vols Care Col. Harmon, Staunton, Va. 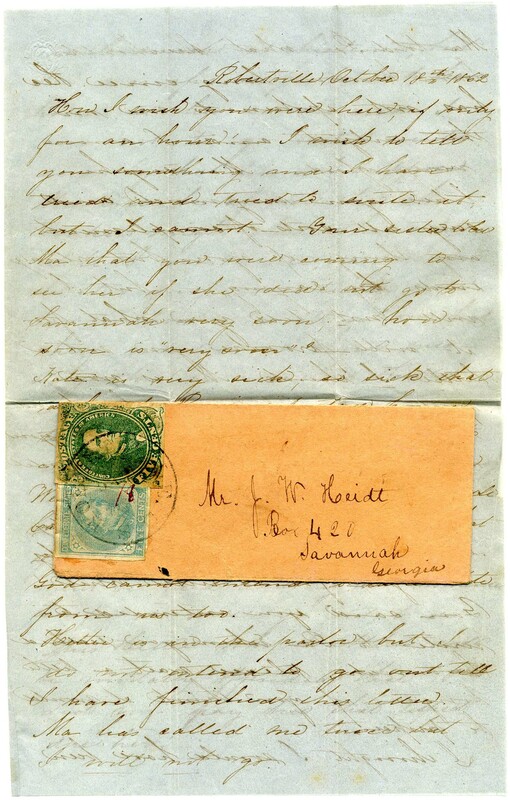 The Drury Lacy family correspondence includes across the lines prisoner letters. Lacy was wounded at Chancellorsville May 2, 1863 - wounded and captured multiple times. Ultimately, he was one of the Immortal 600 held captive under friendly fire as retaliation for the same treatment of Union prisoners. See my article on this unpleasant experience at ASDAPR09.pdf $250. 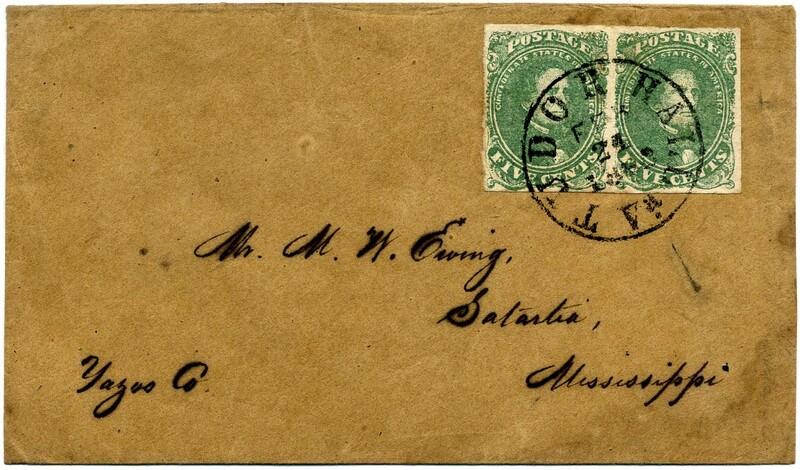 CSA 1, 5¢ green tied AUGUSTA / GA // FEB / 23  double circle cancel on cover to Miss Kate E. Enecks, Egypt PO, Effingham, Co, Georgia. $200. 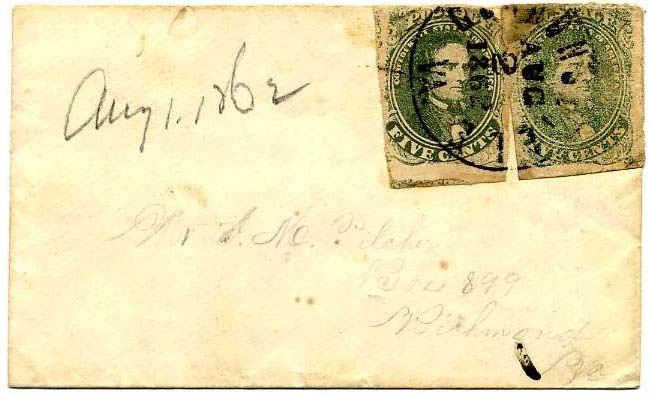 CSA 1, 5¢ green pair (4 margins) tied TUDOR HALL / Va. // FEB / 21 / 1862 bold cds on homemade cover to M. W. Ewing, Satartia, Mississippi (Yazoo County). Lovely clean use. M. W. Ewing was a wealthy landowner recorded as having 66 slaves in the 1860 census, one of the largest slave owner sin Yahoo County. Ex Judd and Brandon. $375. 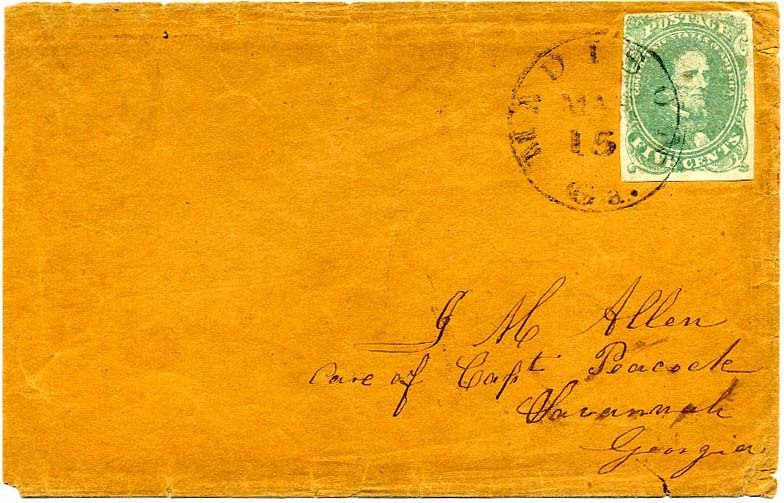 CSA 1, 5¢ green tied TUDOR HALL / Va. // DEC / 4 /  on cover to Mrs. Cary C. Cocke, Bremo (near) Bremo Bluff Post Office Fluvanna County, Virginia. Flap faults and edge tears at top. Ex Brandon. $150. Dr. Cary Charles Cocke (1814-1888) was a physician. His father was Confederate General John Hartwell Cocke and one of his brothers was Brig. Genl Philip St. George Cocke. Much more information on linked page. 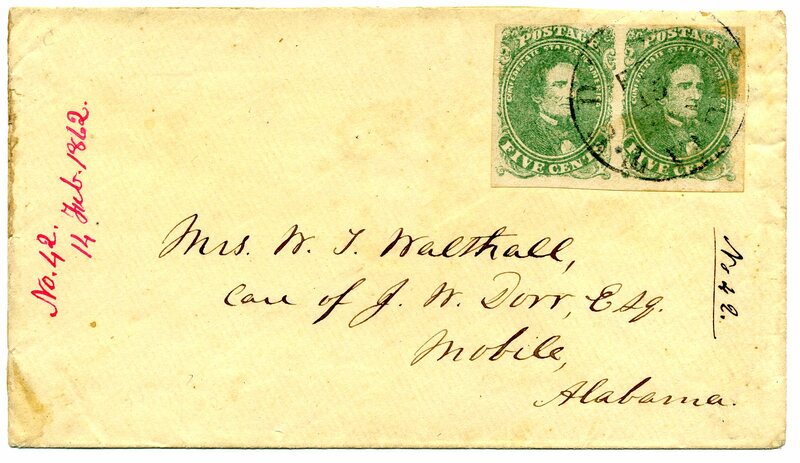 CSA 1, 5¢ green pair tied TUDOR HALL / Va. // FEB / 15 / 1862 light cds on cover to Mrs. W. T. Walthall, Care of J. W. Dorr, Esq, Mobile, Alabama, with red contents docketing at left “No. 42, 14 Feb. 1862.” Ex Brandon. $300. William T. Walthall (1820-1899) enlisted as a captain in Co. I, 12th Alabama Infantry (Southern Foresters [Mobile]) Much more information on linked page. 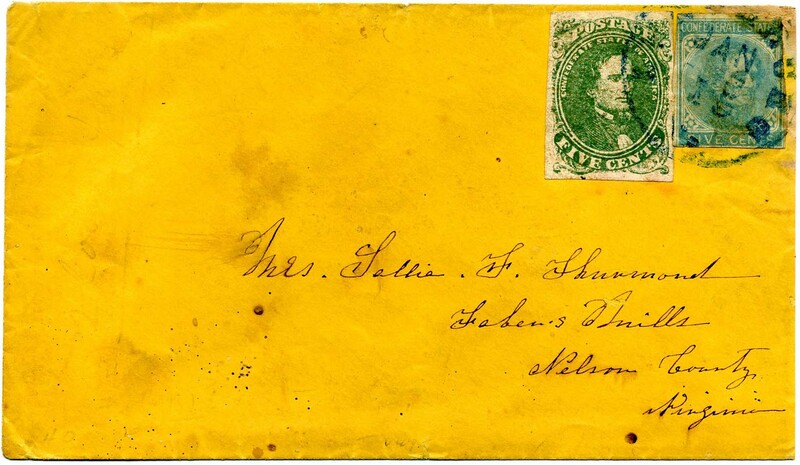 CSA 1, 5¢ green, Stone 1-2 tied in combination with CSA 6, 5¢ blue by blue LYNCHBURG / VA. // JAN 15 cds on cover to Mrs. Sallie F. Thurmond, Faber's Mills Va., slightly reduced at right, No. 6 with some soiling and small corner flaws, still nice mixed franking of typograph and lithograph issues., ex Brooks, Matz and Brandon. $350. CSA 1c, 5¢ olive green pair with ample margins mostly separated by scissors cut (noted by prior owner as Stone AB, not verified by me) tied by lightly struck HELENA / ARK // FEB ? 1862 cds on cover to Peyton S. Coles, Esq, North Garden, Albemarle Co, Virginia. Small stain and opening flap damage otherwise Fine, Ex Harold Brooks. Ex Clippert. $550. Peyton Skipwith Coles was sums up his life work in five words: "A farmer all my life." Much more information on linked page. 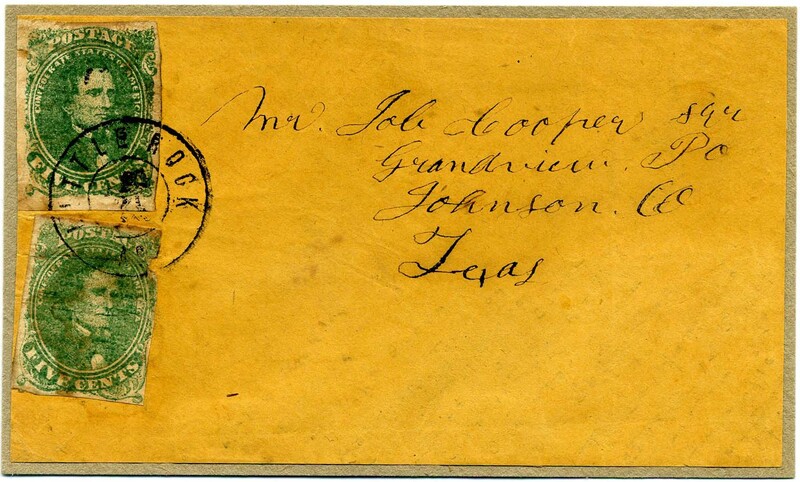 CSA 1, 5¢ green (two singles with small faults) tied LITTLE ROCK / ARK double circle datestamp on cover front only, mounted on card, addressed to Job Cooper Esq, Grandview PO, Johnson Co., Texas. Ex Clippert. $150. CSA 1, 5¢ green (nice margins, tiny facial scrapes) tied blue NASHVILLE / Ten. cds on cover to Wm. E. Austin, Esq, Elkton, Tenn. PRE-WAR TURNED COVER with 3¢ dull red mostly removed from inside. Ex R. Hall. $170. 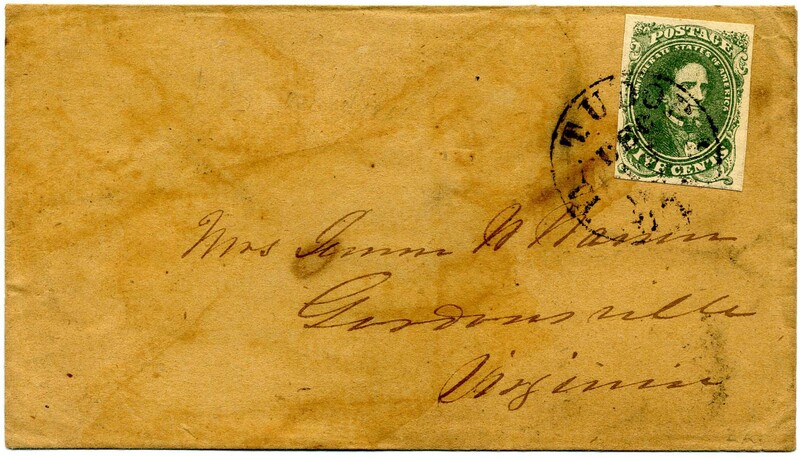 CSA 1-1c, 5¢ olive green (SUPERB 4 large margin), Stone 1, tied TUDOR HALL / VA. // DEC / 13 / 1861 cds on cover to Mrs. Jennie N. Warren, Gordonsville, Virginia. Light staining; Superb stamp alone worth the price. SCV $300. $350. 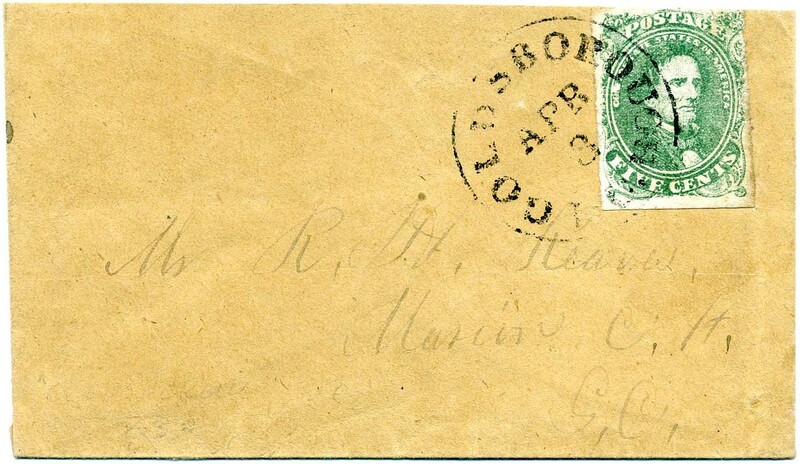 CSA 1, 5¢ green (faint vertical crease and tiniest scuff) tied neat GOLDSBOROUGH / N.C. // APR / 3  cds on lightly cleaned cover, slightly reduced, to R. H. Reaves, Marion C.H., S.C. $200. 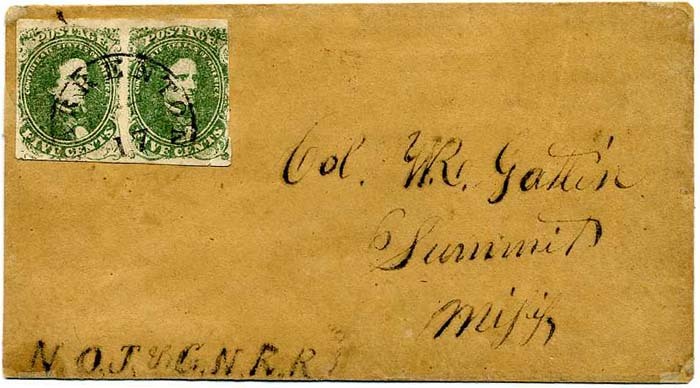 CSA 1, 5¢ green top sheet margin single, roughly torn into at right, tied GRAHAMVILLE / S.C. // FEB / 7 / 1862 cds on cover to Benjamin Ducket, Whitmires P.O., Newberry District, S.C. THE ONLY REPORTED COVER TO OR FROM WHITMIRES. Ex Wayman. $220. 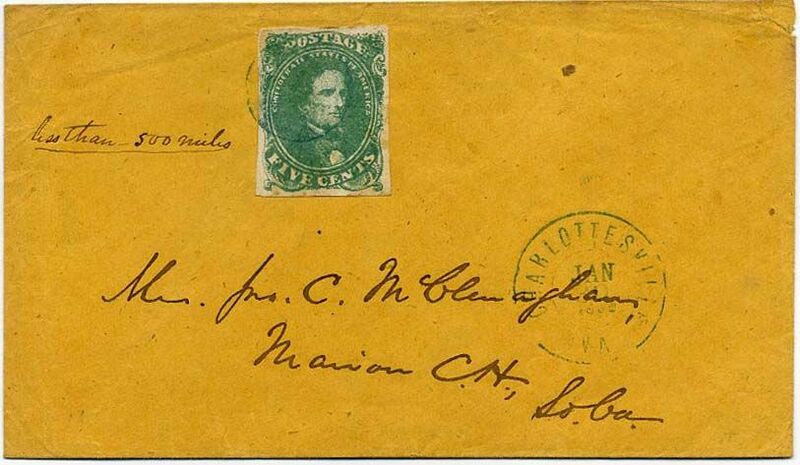 CSA 1, 5¢ green bottom sheet margin pair (faults) used with grids and matching MT SIDNEY / Va. // APR / 5  cds on cover to Revd. James M. Shreckhise, Newberry C.H., South Carolina. 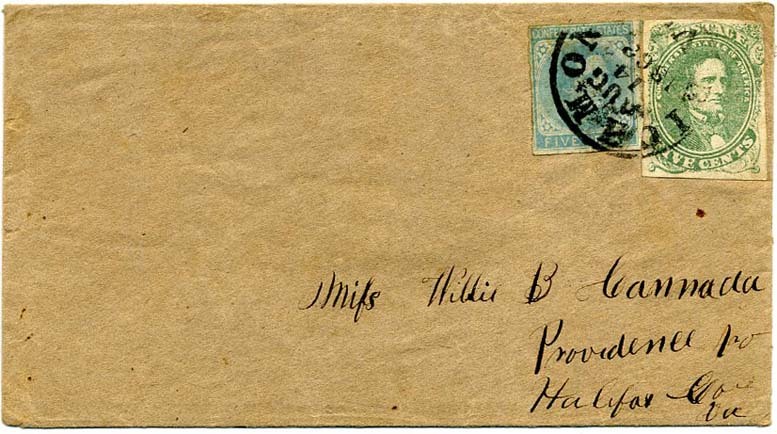 Second pre-war 3¢ Nesbitt entire from Shreckhise correspondence Nov 28  accompanies with same markings used both before and during the war. Ex Wayman. $300. Professor James M. Schreckhise served as the Professor of Ancient Languages at Newberry College from 1862-1865. Much more detailed info on the linked page. 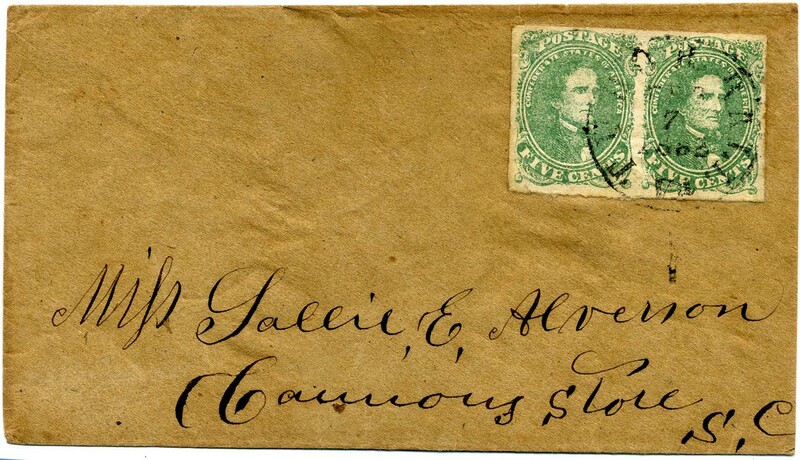 CSA 1, 5¢ green pair (4 margins) tied TUDOR HALL / Va. // FEB / 7 / 1862 cds on homemade cover to Miss Sallie E. Alverson, Cannons Store, S.C. “Sallie” was likely Sarah Alverson McClure (1836-1924). She had several brothers who fought in the war and this likely from one of them stationed at Manassas. Very Fine. $200. CSA 1, 5¢ green, horizontal pair with clear to large margins tied by unusually well struck FRANKLIN / GEO. 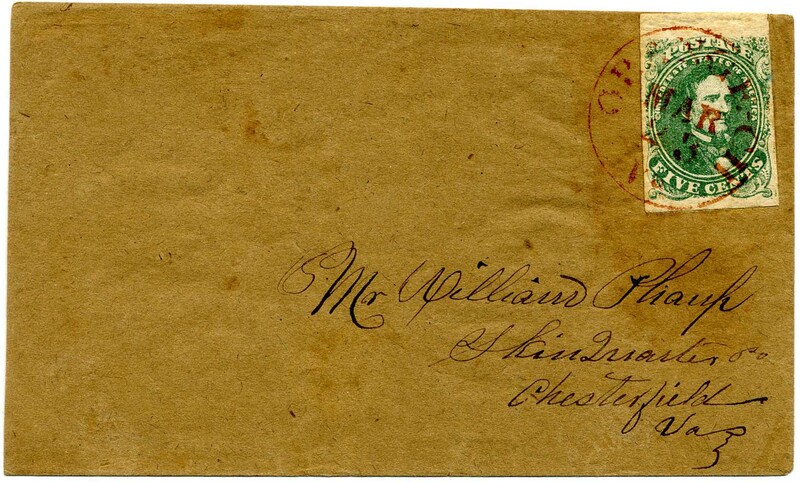 // 1862 // AUG / 9 cds on brown paper cover to Irby H. Scott, Eatonton, Ga. $350. 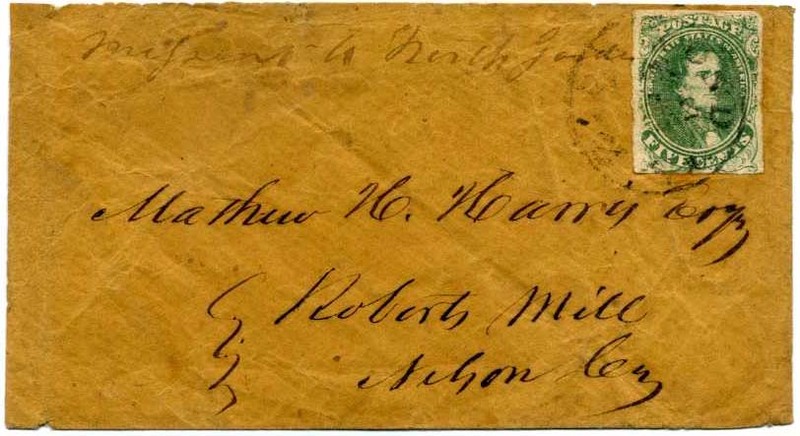 Irby Hudson Scott (1814-1874) served in Company H, 5th Georgia Militia. CSA 1, 5c Green, Stone 1, position 6, plated by the legendary Edward S. Knapp as noted on verso, (4 margins), tied vivid red SMITHFIELD / VA.// JAN / 18 /  cds on cover to W. Cunningham, Cunningham's Store N.C., Extremely Fine, ex Wm. A. Fox, Knapp, Hall and Gimelson, with 2013 CSA certificate. $400. John Wilson Cunningham (1820-1889) was a planter, merchant, and political leader. For a brief time, he served as Confederate receiver for the property of "alien enemies" in the eastern district of North Carolina. Much more detailed info on the linked page. 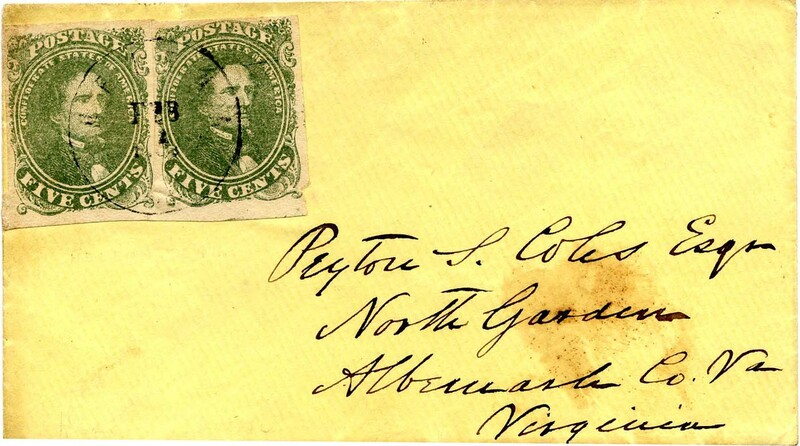 CSA 1-2, 5¢ green, Stone 2, (4 large margins all around) tied neat bold AUGUSTA / GA // FEB / 12  double-circle datestamp on cover to Wm. 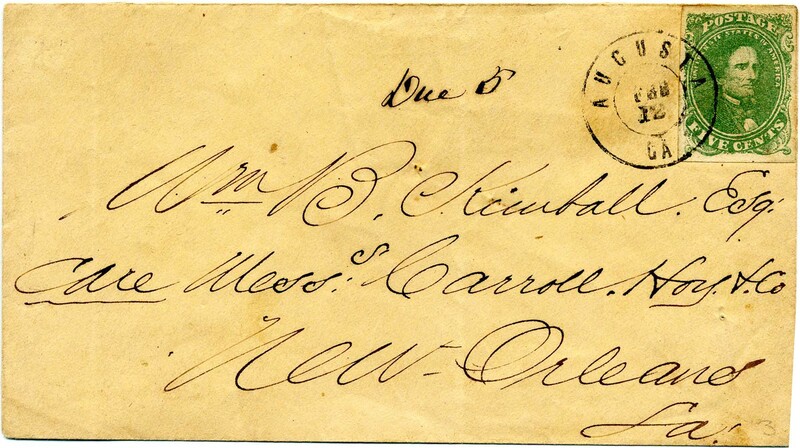 B. Kimball, Esq., Care Messs Carroll Hoy & Co., New Orleans, La., with manuscript “Due 5,” for underpayment of postage (distance over 500 miles), light file folds far from stamp, ex Gimelson (signed on verso). $280. 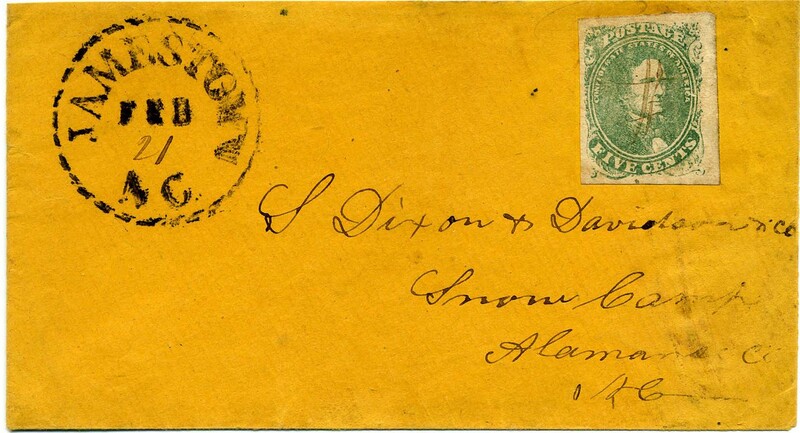 CSA 1, 5¢ green (4 large margins) used with manuscript cancel and large 36mm segmented circle (AKA dotted rim) cds of JAMESTOWN / NC // FEB / 21 (ms) on cover to S. Dixon & Davidson & Co., Snow Camp, Alamance Co[unty] NC, top back flap removed. Dixon and Davidson were architects and builders who supplemented their business with industrial investments such as various types of mills--saw mills, flour mills and cotton mills; much information is available online about them. Showy. $325. 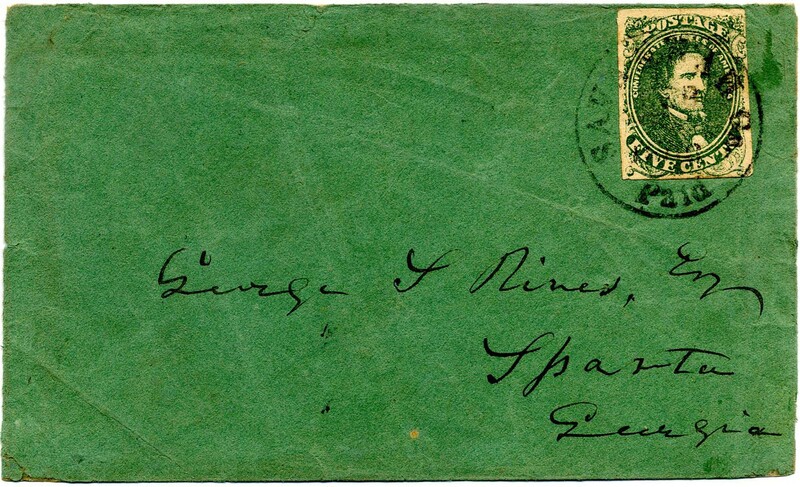 CSA 1, 5¢ green (4 close to nice margins) tied by SAVANNAH Ga. / Paid cds on pretty green cover to George S. Rives, Esq., Sparta, Georgia, lightest cover creases. $150. George Shackleford Rives biography is on the linked page. CSA 1, 5¢ green used in combination with CSA 7, 5¢ blue tied together by ROBERTVILLE / S.C. // OCT / 18  cds with date in magenta manuscript, on diminutive homemade cover to J. W. Heidt, Savannah Ga., slight staining affects the 5¢ lithograph otherwise Very Fine. Original anguished letter concerning sick relatives and hoping won’t be taken away from them too, also Ma not wanting her to go because of potential Yankee shelling of the city. 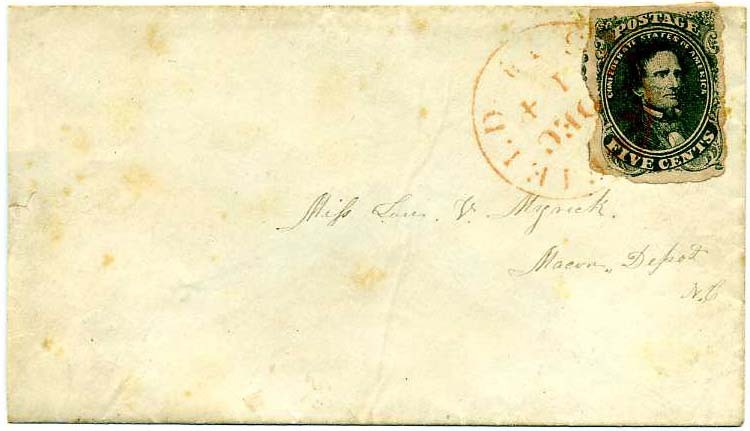 SCARCE AND ATTRACTIVE MIXED FRANKING. $400. JOHN W. HEIDT, DD, practiced law but gave it up for the Methodist ministry; many years a trustee of Wesleyan Female College, as well as former President. More detailed info on the linked page. CSA 1, 5¢ green (two) both tied by bold strikes of NEW ORLEANS / La. // 10 FEB  cds on pristine commercially-made cover to Albert G[allatin] Nalle, Esq., Orange Court House, Virginia. Ex Tate. $350. Albert Gallatin Nalle biographical information on linked page. CSA 1c, 5¢ olive green (4 large margins) tied NEW ORLEANS / La. // 21 DEC  cds on lightly cleaned folded business letter to E. J. Gay, Esq, Plaquemine, La. Very Fine. $260. Edward J. Gay (1816-1889) biographical information on linked page. CSA 1, 5¢ green top sheet margin (4 large margins all around) tied bold orange cds of ORANGE C.H. / Va. // MAR / 23  cds on cover to William Phaup, SkinQuarters PO, Chesterfield, Va., Ex Judd. SCV $525. $450. The Skinquarter Section of Chesterfield County, Virginia, was so named, as the “quarter” where native peoples gathered to skin their animals after a hunt. There is more than one William Phaup from the area thus which one cannot be speculated without further research.